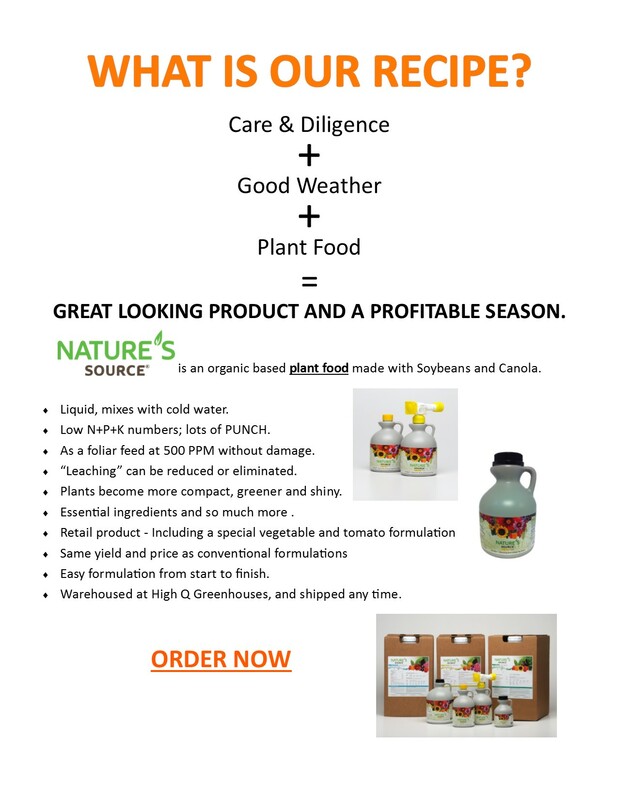 Nature’s Source | High Q Greenhouses Inc. The effectiveness of Nature's Source Plant Food is due to its uniqueness. It's the only professional plant food whose ingredients include oilseed extract, a remewable source of plant nutrition. It is blended with synthetic nutrients to create an optimally balanced, easy-to-use liquid plant food that brings out the best in everything you grow. Naturally. New foliar spray to boost your crops’ nutrient efficiency. Effective. One formulation for everything your customers grow: flowers, trees, shrubs, vegetables, and herbs. Value. Concentrated formula is easy to mix and goes a long way. 1 tablespoon of Nature’s Source makes 1 gallon of plant food. Pathogen-free - heavy metals free.